You can find tiny little wild flowers that can be placed on the cake. Or can be sugared with a little egg white and fine sugar. (which will preserve them) Ferns and tiny greens are also beautiful on a cake. First get one egg white and whip the white a little with a fork until it starts to get frothy. Have a small artist brush ready. Put some super fine sugar in a bowl or on a plate and have a spoon ready. Next get a piece of waxed paper and spread that out next to your egg and sugar. Now gather up your flowers and leaves, Shake off any dirt or dust. Don't wash them or they will wilt. Brush the egg white onto the petals and sprinkle the sugar over the flower or leaf. Place on a piece of waxed paper to dry for a few hours. Arrange them them on the cake. they will last a day or two on the cake. Fresh fruit is another winner. Again you can sugar it as you did the flowers. Use small fruits like grapes, fresh currants, tiny mini pears and apples etc. Toasted nuts chopped finely and coconut toasted or fresh is a really great way to cover the sides. If you need help covering a messy frosting job this is the way to go. Textured icing like the fluffy white waves you make while swirling the icing around in circles is easy and looks nice. If you want to wow people with your skills basket weaving is a simple cake decorating technique. It is the first thing I teach to my students after they learn how to frost a cake. I have directions on my web site with cake decorating videos and tutorials. 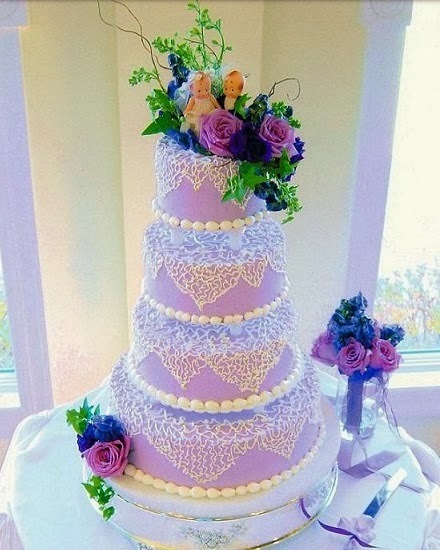 Ribbons are fabulous as long as you attach them to wire first and stick the wire into the cake. They look really nice with a mix of fresh flowers. Fondant which can be purchased at Michaels or other craft stores is fun to play with.Roll out and cut into shapes. If you get the gum paste cutter set it includes directions for cutting and shaping. You can work your way up to the more complex fondant flowers. Always work with frozen or very cold cakes. This makes it so much easier to frost and decorate. The cake will thaw inside the icing which will help to keep it moist. Do not attempt butter cream roses if you are truly a beginner, until you practice working with butter cream and piping bags- a lot. That is one skill that if not done well it really shows. Simple borders in the beginning would be dots and rosettes, using a round tip or shell tip. Practice using a pastry bag a lot. Use different angles and pressure until you get the hang of it. You can cover mistakes by adding a piece of sugared fruit, flowers nuts or bits of chocolate on each rosette. decorating a cake with chocolate is another great way to make your cake look professional. Here are a couple of easy but impressive techniques. Melt the chocolate either carefully in the microwave or over a double boiler. using a fork swirl the chocolate over your cake randomly. Place a piece of waxed paper on a tray and swirl the melted chocolate over the paper. Put it in the fridge foe a few minutes until it hardens. Now remove carefully the pieces of the swirled chocolate and arrange in the center of the cake. You can make it three dimensional by propping them up against each other or sticking them straight into the butter cream. So as you are on your journey to professional cake decorating, which this HOBBY sometimes leads to, you can use these simple yet effective cake decorating ideas. Lorelie Carvey is an award winning cake decorator who specializes in wedding cakes and would like to help other cake decorators hone this craft.